Located in Santa Rosa Cove is a gated community adjacent to and with access to the public facilities of the exclusive world famous La Quinta Hotel. Its living room, dining area, master bedroom, and patio with BBQ dining area face directly onto the 10th green of the Club's incredible Mountain Course. 49-240 Avenida Vista Bonita is on the Mountain Course 10th fairway, 3 bedrooms, 3.5 baths, 1,922 sq. ft. with guest house, private courtyard and spa. This spacious, elegantly decorated, one level home is located in Santa Rosa Cove! 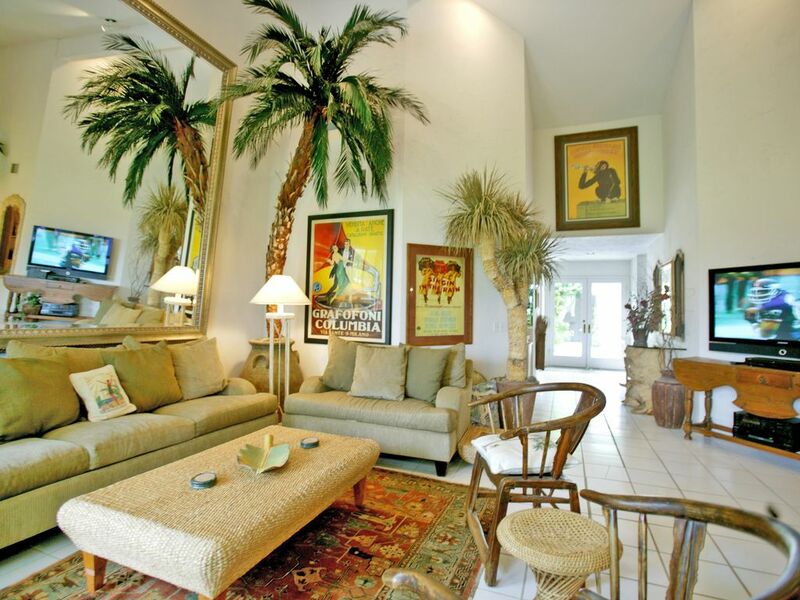 This custom decorated home is turn-key furnished for your carefree vacation enjoyment. Casa Bonita's open plan great room with gas fireplace and formal dining area have French doors to the outdoor dining and lounging area overlooking the 10th green of the world famous La Quinta Hotel Mountain Course. The fully equipped eat-in kitchen faces a private exterior courtyard with spa. The large California King master suite faces the 10th green. The second bedroom suite with twin beds opens to a private open-air interior courtyard with spa. The third bedroom suite with queen bed is a separate guest Casita, also off the interior courtyard. All Bedrooms have private baths, televisions, telephones and individual entrances. Steps away are the Hotel's trendy shops and restaurants, state-of-the art Oasis SPA, and of course its golf clubhouse. - Our Santa Rosa Cove Association has many large private shared pools with spas plus free tennis for your enjoyment (contact us for details). - The hotel's public facilities which include restaurants/cocktail lounges, shops, spa, and golf courses are open to the public and available for your enjoyment. - PLEASE NOTE that the Hotel pool, fitness center and their paid tennis are for "hotel guests only". We are a San Francisco based couple who discovered the unique La Quinta Resort over 30 years ago. We subsequently purchased our home in the gated community adjacent to the hotel with their expansive green golf course vistas, spacious living areas, and great guest entertaining spaces. We cherish being able to stroll from home with our little dog Mojito to the hotel where there is always action: morning coffee, brunch, evening music, cocktails, and dinner. We are professional realtors and property managers and have uniquely decorated and equipped our home with vacation visitors in mind. Our super local property manager, will assist with checking in, familiarize you with the property and be on call for any assistance needed during your stay. Overlooking the 10th green of the world famous La Quinta Hotel Mountain Course. Free USA and Canada long distance calling. Phone/fax in kitchen/breakfast area plus phones in each bedrooms. In garage , passenger vehicles only. NO RV's, trucks or trailers. The fully equipped eat-in kitchen faces a private exterior courtyard with spa. Living room has 50' plasma hdtv, dvd, & cd player, stereo, and IPod interface cable. Bedrooms have cable tv and dvd. We have local management/maintenance staff.